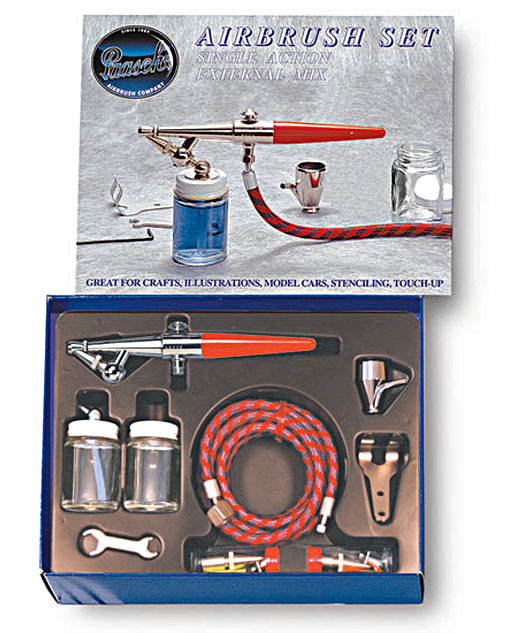 Paasche AIRBRUSH SETS A, B and C come boxed with a 22-lesson airbrush booklet plus parts & accessories listed below each photo. Braid-covered plastic air hoses are also included with each set. All three sets have 1/8" x 6 ft. hose; Set C also includes a 3/16" x 6 ft. hose. Recommended air pressure for A, B and C is 20-45 lbs. PSI depending on tip size and fluid being sprayed. 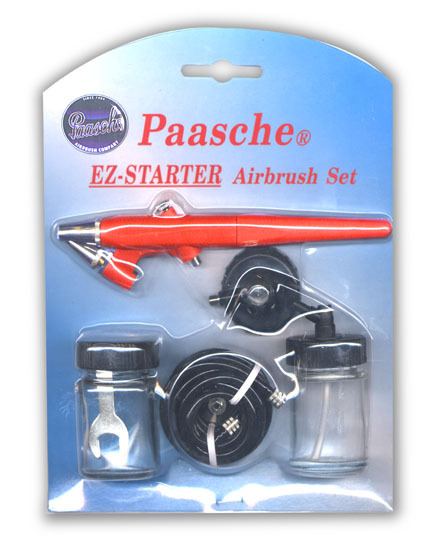 Paasche EZ-Starter Airbrush Kit "D" is a beginners kit for the first time user of an airbrush. Sprays oils and water-base materials. Kit is blister packed and includes airbrush, 5 ft. x 1/8" plastic hose plus parts listed below photo D. Recommended working air pressure for "D" is 15-50 lbs. PSI. 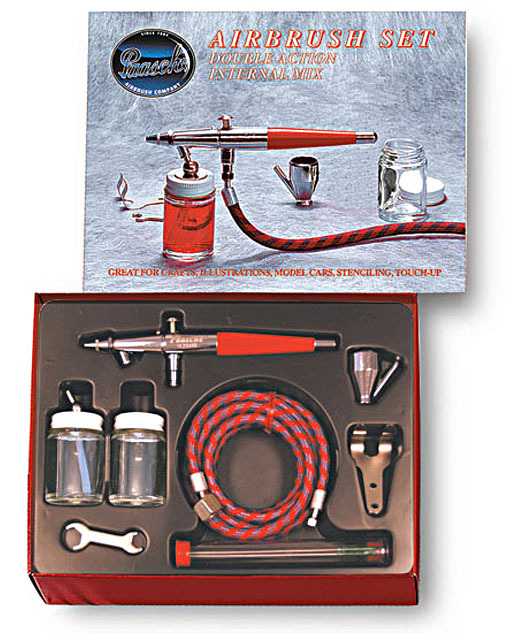 Paasche airbrushes will work with any compressor or Paasche canned propellant. Airbrushes warranted one year by Paasche. IMPORTANT: These airbrushes are NOT designed to apply Tanning Solution. We do carry an airbrush, however that is specifically designed to apply tanning solution and/or tan extender. Click below to view. Paasche H Airbrush. Single Action (light) External Mix. Has 1/32" to 1-1/2"W spray pattern. Set includes 1/4 oz. metal color cup, 1 oz. bottle assembly, 1 oz. bottle w/cap, 2 color adjusting parts (med. & heavy), braided hose & hanger. Paasche VL Airbrush. Double Action (light)Internal Mix. Has 1/64" to 1-1/2"W pattern. Set includes head cap, 1/4 oz. metal color cup, 1 oz. bottle assembly, 1 oz. bottle w/cap, VTL-3 & VTL-5 tips (med. & heavy), wrench, braided hose & hanger. 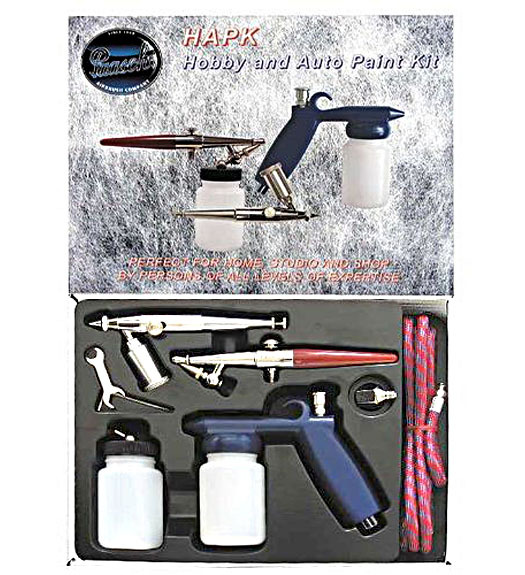 Paasche HAPK Airbrushes. Set of 3: Single Action H#L3 (med. ); 1/32" FP Flow Pencil; & #62 Glaze Gun (light). Set also has 3 oz. bottle assembly, braided hose & 2 wrenches.